The best inventions are simple and transpire out of out of necessity. Such was the case with the Juppy Baby Walker. 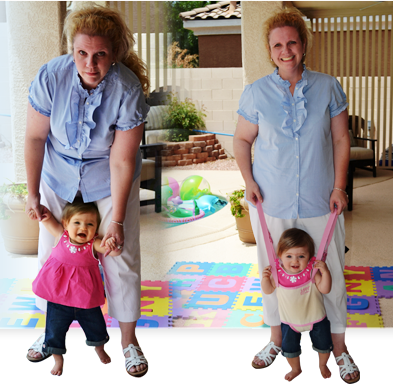 The Juppy Baby Walker is an innovative way to teach your baby to walk without hurting your back or baby's arms. I'm sure you will agree that mommies everywhere have been putting quite a bit of strain on their back while teaching their babies to walk. Babies love Juppy because it fits securely and completely supports your baby's body. This gives babies confidence to take their first steps. I enjoyed looking at the pictures of babies in their Juppy Baby Walker, I never saw such happy babies. Juppy Baby Walker not only saves mommy's back, but reduces the risk of nursemaid’s elbow. This is a minor dislocating of the elbow that occurs when a child’s arm is pulled upward or outward. So it's no surprise that Juppy is recommended by doctors. 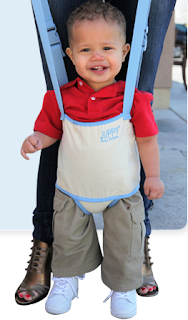 The Juppy is suited for babies of all sizes. The Juppy is made from 100% cotton and is easy to clean. Juppy easily folds and will fit into any handbag, so you can have it with you at all times. An absolutely fantastic way to teach baby to walk. I think the Juppy Baby Walker is pure genius and long over-due. Really like the convenience!! Love the blue for all my grandbabies!! I follow and I like the pink one! Love the blue. Like you on facebook as well. This would be great for my new grandson. gfc follower and I would love to win a pink one. I have a daughter that is about ready to learn. I think this product will help a lot!! I would choose the black and yellow one so you could use it for a boy or a girl, and it wouldn't look dirty as fast. Following on GFC, my favorite colors is the tan and pink. What a neat invention! Love it! Following on GFC. The thing I liked best, I think, is that it is machine or hand washable! "Liked" the Juppy Baby Walker on Facebook. "Liked" your page on Facebook. I follow you with GFC and I like the blue one!! This is so cool!!! I like the juppywalker on facebook! I'm a new FB fan. I follow the juppy baby walker on twitter. I'm following you on GFC and I like the pink one! I'm following Juppy Baby Walker on Twitter! Would love the blue for my ds, also love that its machine washable and safe for him an mommy! I love the pink one! Our newest granddaughter was just born 2 weeks ago! Following Juppy on Facebook and Twitter! I learned that this product can be used for special need children. It is also doctor recommended and is parent used 100% so less chance of accidents. I am following. I prefer blue, and wow, I had nursemaid's elbow as a toddler! I never really thought about why! Now I know! GFC follower scoop, I'd love the blue juppy - very cool! i like the fact u dont have to bend over and hurt ur back trying to hold your child i also like the fact that u dont have to hold your childs arms ...im always afraid im gonna pull something on my daughter..... freedom is better for the both of us!!! I learned on the website that it would help eliminate back pain and I LOVE that idea! I follow via GFC and I prefer black. I like the blue. What a neat idea! GFC follower. I would choose the black. I follow via gfc as Kristi S and I would love the blue one! I clicked the "like" button on the bottom on the page! I 'like' The Juppy Baby Walker on Facebook as Kristi Summit. 1 Entry: 'like' my Facebook page, for easy access you can find it on the upper right, below Google Friend Connect. I love the pink one, my friend just had a baby girl and this would be perfect for her.